Always Call 811 Before You Dig – It’s Free & It’s the Law. The 3rd Annual NRCGA Utility Locate Rodeo takes place April 27! The Nevada Regional Common Ground Alliance is open to any individual, organization, municipality or corporation interested in the promotion of underground damage prevention in the state of Nevada. The NRCGA provides a forum for members and non-members to exchange information and ideas at monthly meetings, offers free excavator training on damage prevention and Nevada excavation law, and holds events throughout the year to educate homeowners and excavators about the importance of calling 811 before beginning any digging project. 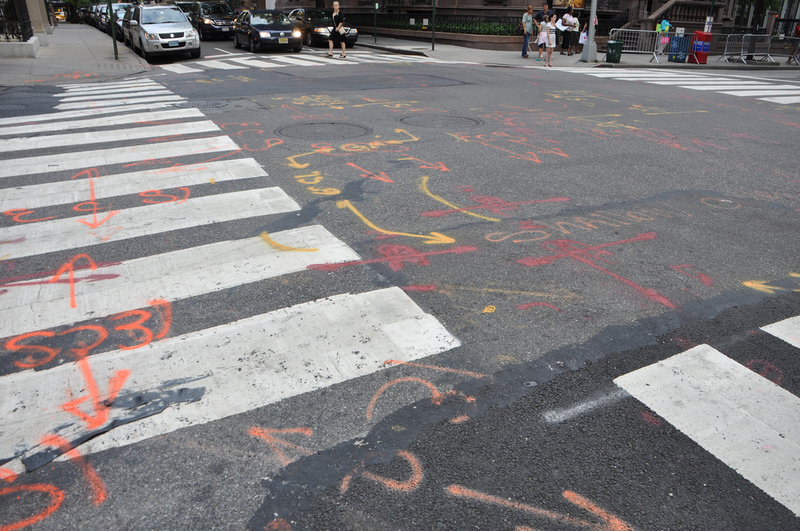 Buried electric lines (red paint) and communication lines (orange paint) are marked in this city intersection. An underground utility line is damaged once every six minutes nationwide because someone decided to dig without first calling 811, according to data collected by Common Ground Alliance. The CGA, the association dedicated to protecting underground utility lines and the safety of people who dig near them, collects information from utility owners to measure the scope of damages throughout the United States. Whether you are using a shovel or a backhoe, at least 2 business days before you begin your residential or commercial excavation project, call 811 or visit www.usanorth811.org to request a dig ticket online. It’s quick, it’s easy, and it’s the law!